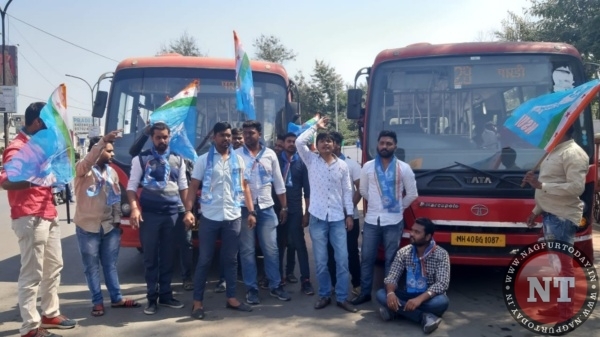 Nagpur: Expressing their anger and frustration against Star bus fare hike by the Nagpur Municipal Corporation (NMC), the city unit of National Student Union of India (NSUI) took to agitation at Variety Square on Monday afternoon. Students raised slogans against the NMC and demanded that the NMC withdraw the newly included 25% hike in the public interest during the protest. Talking to Nagpur Today, Ajit Singh, Maharashtra State Youth Congress, General Secretary alleged that the administration is denying students new bus pass without any firm reason and not revealing any reason regarding the fare hike. “With broken doors and windows, tore seats, the star in Star bus seems to be an illusion, when you acutely travel in it. Star buses are earning pile of money with advertisement and promotion displays on the buses however the NMC official kept on expressing their money crisis when asked about the fare hike,” said Singh. He further alleged that, the students are deprived of new passes without any firm reason and NMC is only renewing old passes, due to which students are in distressed. Ashish Mandpe, President, Pratik Kolhe, General Secretary from NSUI Napgur with Pranay Singh Thakur, Chetan Meshram, Anirudh Pande along with other members of NSUI demonstrated their anguish on this occasion.